Throughout the 13 weeks voting cycle our media partners will promote the awards to their readers and viewers and our in-house communications team will be engaging with past voters and subscribers. Trinity Mirror’s national and regional travel editors promote the awards across their newspaper publication and companion websites. Saturday editions of the Daily Mirror feature a column on how to enter the awards and highlight the prizes on offer from our voters’ prize draw partners. 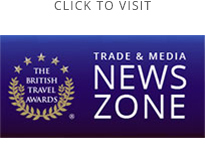 Over 200 (8cm x 4 column) voters’ prize draw partner advertisement inserts will be placed across national and regional titles; driving readers to the British Travel Awards voting website and promoting draw prizes from our sponsors and prize incentive partners. We review web content published by nominee companies and Mirror travel journalists during the week prior to publication; then include articles and videos considered to inspire and assist consumers with their leisure travel plans. Content is presented in a newspaper style format which links back to the nominee’s source web page. December - March issues feature content from the top three category winners in the British Travel Award. Our database of over 500,000 (GDPR confirmed) subscribed past voters is not shared or sold to any third parties. Up to four sponsored e-newsletters are sent to this receptive group of leisure travellers during the voting cycle. Delivered under the British Travel Awards banner, we invite past voters to participate this year, provide them with details of the awards, updates on the cache of goodies in the voters prize draw and, of course… a message from the email’s sponsor!